It was much colder than average for this time of year which made it difficult. One morning was eleven degrees below zero F. One snowstorm of several inches occurred. I only opened the huts to let the sows go out to drink, eat, and urinate/defecate. Keeping the huts closed help to keep some of the sows body heat in the hut. Having the huts in the hoop barn kept the moisture from the snow from being a factor. I used about one bag of wood shavings for each hut and gave a fresh slice of straw daily. This was on top of a base of wood chips from Menard’s. The sows all farrowed within a week of each other. They averaged over 11 piglets born alive. 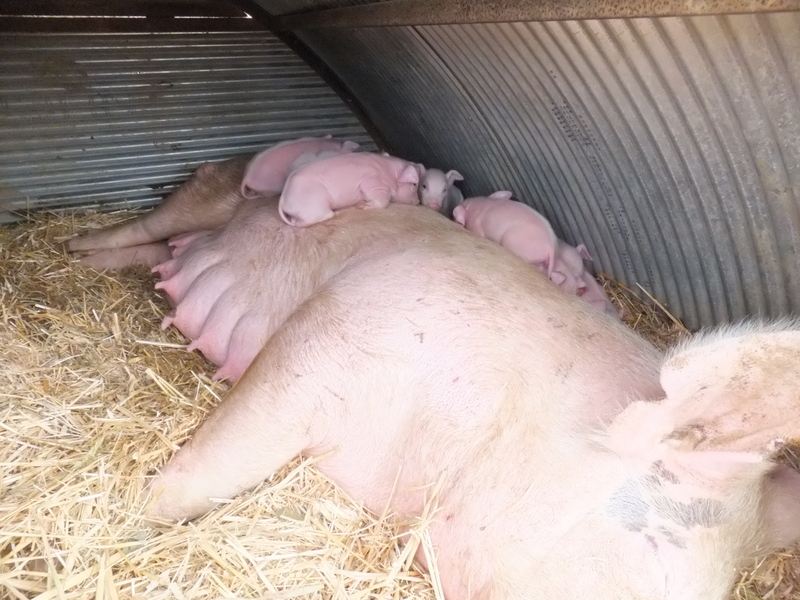 Now, about ten days later they have an average of 8 piglets nursing, so there was a good deal of loss. When conditions are this difficult, it seems that piglet vitality plays a large part in survival as well as the mothering ability of the sow. As the temperature warmed into the 30s F, I left the doors open and put the rollers on to keep the piglets in but allow the sows to come and go as they please. 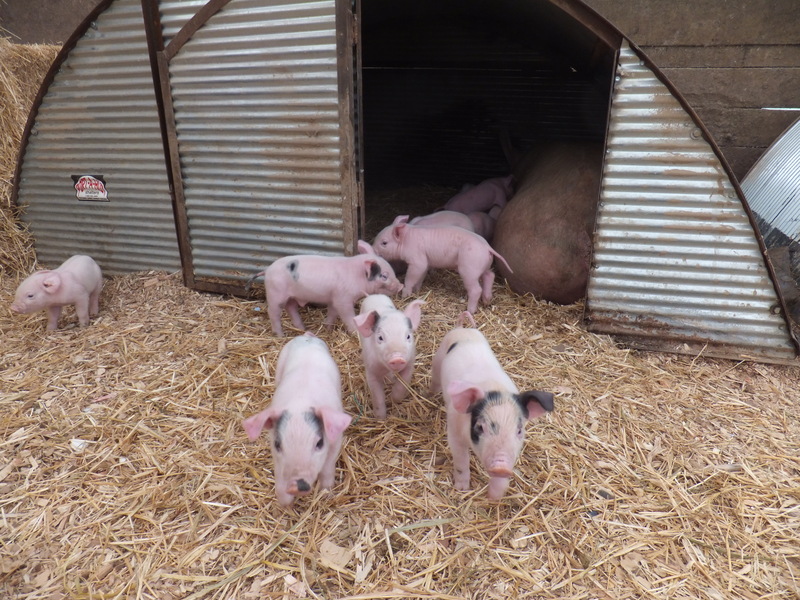 The piglets only stayed in for a few more days before they began to jump out. So I’ve removed all the rollers now and the piglets are able to explore. The piglets in these photos are only a week old. It’s amazing how precocious they are. 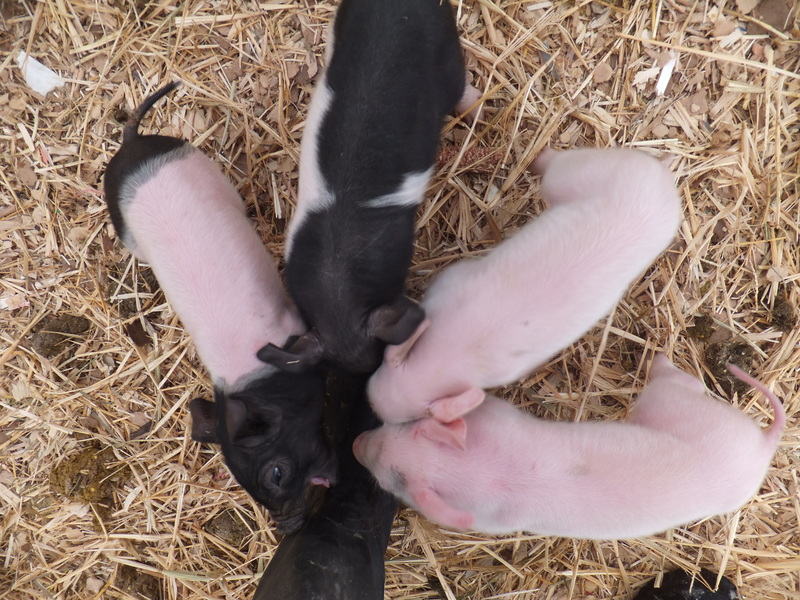 Look at the open mouth on the black and white piglet below, trying to decide if my boot is worth eating. This entry was posted on Tuesday, March 11th, 2014 at 5:17 pm and is filed under Curious hogs. You can follow any responses to this entry through the RSS 2.0 feed. You can leave a response, or trackback from your own site. Do you keep any of the young females for breeding stock? I wonder if they will be hardier and more instinctive than their mothers, which in turn will pass on to their young? I raised sheep for many years. Because it was a hobby flock of only 20 ewes, I tended to treat them as my pets. When my husband finally convinced me to stop babying them and to allow them to raise their young naturally, as you’re doing with your pigs, I found that with each generation they became better mothers and birthed hardier lambs. PS. Those piglets are SO cute! I see your sows let you walk among their piglets, if a stranger was with you would they be able to do the same? Di, Interesting about your sheep. Yes, I’m always selecting and hoping to improve on the traits I deem important. I think I’ll do a genetics post soon. Gordon, The sows were protective the first few days, especially when I was letting them in and out as they viewed me as a threat. I carried a small shovel for protection as a couple of them would come at me aggressively. It’s better if I can not interact as much with them. I waited until they mellowed a bit before showing the litters to my kids and my sisters’ kids. It also made it difficult for me to leave the farm during that week because I wouldn’t want to ask someone else to let them in and out of their huts. Too dangerous and too upsetting to the sows.